Taking a cue from our favorite juice bar combos, this dense, not-too-sweet cake gets loads of moistness from both carrots and carrot juice, and a hint of heat from two kinds of ginger. 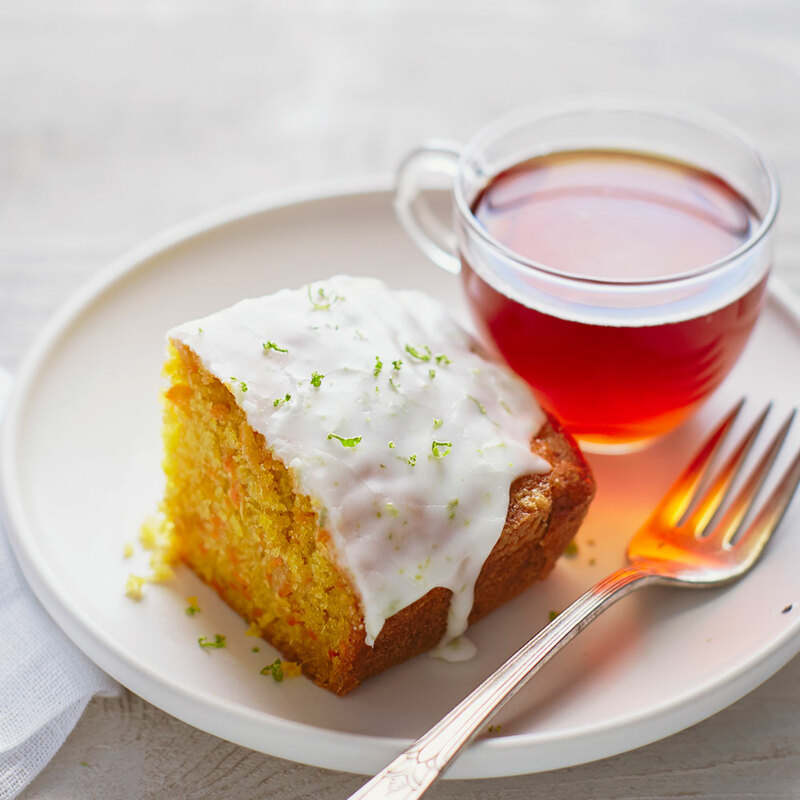 The lime glaze adds a tangy kick. Preheat oven to 350°. Butter an 8-in. square pan, line bottom with parchment paper, and butter it. Flour inside of pan, tapping out excess. In a medium bowl, whisk together 1 1/2 cups flour, the baking powder, ground ginger, baking soda, and salt. In a large bowl, whisk granulated sugar, 1/4 cup melted butter, the oil, carrot juice, eggs, and fresh ginger until combined. Add flour mixture and whisk just until smooth. Stir in carrots and scrape batter into pan. Bake until a toothpick inserted in center of cake comes out clean, 40 to 45 minutes. Let cake cool in pan on a rack 10 minutes. Run a paring knife around edges to loosen, then turn out onto rack. Turn right side up and let cool completely, at least 1 3/4 hours. In a small bowl, stir together powdered sugar, lime zest, and 1 tbsp. lime juice until smooth. Add more lime juice (about 1 tsp.) for a thick, flowing texture. Drizzle over cake. Make ahead: Through step 3, up to 1 day at room temperature or 1 month frozen (let cool, then wrap well).